Comments/Context: For many photographers, the technical aspects of the optics of photographic recording form the starting point for their artistic explorations. And once an artist digs down into the scientific details of light, color, polarization, and other factors, the urge to test the limits, extend beyond the usual parameters, and explore new possibilities, all in the name of finding alternate modes of artistic expression, seem to be a natural next step. 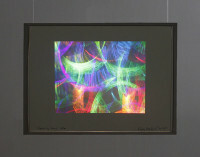 Holography, a nearby relative of photography, experienced a short flowering of artistic interest in the 1970s, and this small show of the work of one of its leading proponents, the Dutch artist Rudie Berkhout, provides plenty of evidence for why it was an appealing technology for experimentation. In a transmission hologram, a glass plate treated with silver halide is the base element, with a light shone through the back illuminating the crystals and creating the appearance of a three dimensional image suspended behind the surface. The exciting thing about a hologram is its unexpected three dimensionality. The resulting image is similar to our experience of sculpture – as we move around and look at the work from different vantage points, our view shifts and turns in three dimensional space. Forms appear to rotate and realign, light and shadow dissolve, and distortions of perspective start to appear. Compared to the relative flatness of most photographs, a hologram has a seductive richness of depth and space, and in a sense, a rounder physical presence. Berkhout smartly avoids the hologram clichés of long dead celebrities seemingly returned to life and instead explores how geometric patterns and abstractions function when given three dimensional life. His subjects are the elemental forms of squares and circles, cubes and orbs, arrays of tiny dots, and gestural marks that range from smooth arcs to jagged electrical squiggles, the simple shapes repeated out into all over arrangements and layered compositions floating in indefinite blackness. But what gives Berkhout’s images their vitality is the way the colors and orientations of the objects are transformed by movement. Small changes in vantage point, especially up and down, shift the color spectrum dramatically, the changes so significant that even small differences in perspective yield markedly different results. In the installation shots above, two images were made of each work, generally from “high” and “low” vantage points, and the side by side comparisons demonstrate just how much change takes place as the viewer moves around in front of the work. Generally, there is a shift from blue and green registers to yellow and red ones, but it’s as if the work is alive, just waiting for our interaction to allow it to perform. The marching triangles and circles of Interchange (from 1979), for example, not only wander across a rainbow of color combinations, the forms twist and turn, becoming elongated versions of themselves or entirely disappearing in some cases. In this way, Berkhout has freed simple repetition from obviousness, and inserted a bit of mystery to keep us looking. The same might be said of Sketching Away (also from 1979), but in this case, Berkhout has employed emphatic slashes and gestural marks, creating a densely expressive abstraction that reconfigures itself (and its color palette) when seen from different angles. It almost made me wish that Pollock or De Kooning had discovered holograms, as the potential for whirling knots and splashes of insubstantial and constantly moving color is obvious. In many ways, re-introducing ourselves to works like Berkhout’s offers a kind of back-to-the-future approach to contemporary artistic thinking. With so many powerful new tools now available to digital photographers, we should also encourage ourselves to become more aware of and interested in the early innovators in the analog realm who thought about these issues decades earlier. Instead of reinventing the wheel, we need to research and celebrate those who came before (like Berkhout), standing on their shoulders as we move ahead, rather than blindly re-solving the same aesthetic problems without the hard earned knowledge of what has already been tried. Berkhout’s holograms remain energetic and vital, even some forty years since their original making. And given their potential to be experienced in nearly an infinite number of ways, they feel like the kind of works that offer endless interest and surprise to those who are willing to embrace their unconventional magic.